I have always found astronomy and cosmology fascinating since I was a boy, and so I follow several science blogs. Recently two of them published interesting blog posts on probability and Bayes Theorem. Even if you’re not much interested in maths, I think there’s plenty worth looking at in these posts. Bayes Theorem is a formula for calculating a new probability of a hypothesis being true, after new evidence is considered. It is based on the idea that if a new piece of evidence is more likely if a hypothesis is true than if it is false, then it raises the probability that the hypothesis is true. One new piece of “positive” evidence doesn’t necessarily make the event highly probable, just more probable than it was before, to a degree that can be mathematically demonstrated. For example, a heavy smoker has developed a bad cough and fears he may have lung cancer, though he has no other symptoms. He insists on having tests. His doctor knows, based on population statistics, that about 15% of active male smokers develop lung cancer at this man’s age. The doctor orders a CT scan, which returns a positive result, but the doctor also knows that CT Scans have a false positive probability of about 20%. So what is now the probability that the smoker has lung cancer? Bayes Theorem allows the new probability to be calculated (and if my maths is correct, the new probability is about 40%). Aron Wall is a postdoctoral researcher studying quantum gravity and black hole thermodynamics, and blogs at Undivided Looking. He is a christian, and his blog covers many aspects of physics, mathematics, philosophy and christian belief. For every dead person, 99.9999…% of the time God does not intervene. Therefore, we can be 99.9999….% certain that God did not intervene in Jesus’ death. Therefore, the reader asks, isn’t it true that no matter how much evidence there is for the resurrection, the prior probability in a Bayes analysis will always be so low that the final probability (known as the posterior probability) must always be very low? For every American citizen who lives during a presidential election, 99.9999…% of the time they do not become President. Barack Obama was a living American citizen in 2008. Therefore, we can be 99.9999….% certain that Barack Obama did not become President of the United States. Obviously this argument is false, but why? Aron points out that the argument might be true for a randomly selected American, but Obama belonged to a small class of people who are much more likely to become President – a candidate with certain gifts and aspirations. With that additional information, premise 1 is not applicable to him. So, he suggests, Jesus too belongs to a small class of people – someone who claimed to be the Messiah, did miracles, even predicted his resurrection – and so the probabilities of randomly selected people being resurrected don’t apply to him. There’s a lot more in the post about probability assumptions and calculation, but one other example seemed especially helpful. He discusses how Europeans used to think all swans are white, because they were the only swans they saw in Europe. Drawing the conclusion that all swans are indeed white might be valid if the swans they observed in Europe were randomly selected from the world population of swans. But they are not. All swans in Europe were white, but there are many black swans in Australia. The inference was based on a non random selection. The lesson is that we have to be careful when estimating probability not to assume observations or conclusions are random when in fact they are not, but of a special class. We may disagree about the evidence for the resurrection, but it is important to try to frame the argument properly. I have referenced Luke Barnes and his blog, Letters to Nature several times before. Luke is a Postdoctoral Researcher in cosmology and astrophysics, and has taken a particular interest in the scientific evidence that the universe is surprisingly “finely-tuned” for life. Luke has had a running “battle” with historian Richard Carrier about the science and probability of fine-tuning. Luke is (apparently) an agnostic or perhaps, more recently, a deist or theist (he doesn’t discuss his beliefs much), while Richard is an atheist. A while back I reported how their argument about fine-tuning was judged by Carrier’s friend and fellow atheist JJ Lowder as being decisively won by Barnes – not surprising since Barnes was arguing on his area of expertise and Carrier was not. Recently Richard Carrier resumed the argument about fine-tuning, sometimes using probability, and Barnes responded with two posts mainly on the fine-tuning and two (here and here) on probability – which is what I’m focusing on here. As you’d expect, Carrier fares worst again on the science, because Barnes knows what he’s talking about and Carrier is only an amateur. Barnes says Carrier doesn’t even understand what fine-tuning is. Carrier quotes a couple of genuine scientists, but they are a minority, and Carrier apparently thinks that quoting a small number is sufficient to stand against the broad consensus that Barnes references. It is hard to understand why Carrier has returned to this part of the argument, because he’s clearly arguing against the evidence, something you would expect he, as a naturalist, would be opposed to. Carrier makes much of Barnes not responding to his arguments here, and quotes two papers that oppose the theistic argument. But Barnes has not really addressed the theistic argument and it is hard to see from this exchange what he thinks of it. His interest (in this discussion at least) is in the facts of science and mathematics. It is disconcerting to observe that Carrier seems to confuse the scientific facts and the theistic argument that builds on the facts, and thus seems to think that what he sees as a strong anti-theistic argument somehow changes the scientific facts. Carrier shows much confusion about basic probability concepts. Carrier confuses and mixes frequentist and Bayesian probability, two approaches that have quite different bases. He doesn’t seem to be aware of the mathematical axioms and proofs behind the two different branches of probability theory. Carrier’s novel approach isn’t endorsed by any of about thirty mathematicians that Barnes has read on the subject. Until Carrier publishes it in a peer-reviewed journal, any novel approach cannot be taken seriously. Barnes, as a cosmologist, uses probability in his professional life, whereas Carrier, as a historian, does not – although he has written on probability and history, his views haven’t generally been accepted (see below). Carrier is trying to support what appears to be a dogmatic view of the historicity of Jesus, based on probability, so seems more likely to have external reasons to argue the way he does, whereas Barnes appears to have no such agenda. I haven’t attempted to follow the mathematics in detail, but Barnes’ general arguments make more sense to me. Others have also concluded that Carrier has a poor understanding of probability – e.g. Jeffery Lowder’s criticisms of Carrier’s side of his argument with Barnes included significant criticisms of his ideas on probability. Lowder hasn’t yet commented on the latest exchanges. “Tim Hendrix” (an anonymous commentator whose religious views I don’t know, but he doesn’t think the fine-tuning argument for God is very convincing, and he appears to know probability very well – could he be Tim McGrew?) takes apart Carrier’s statements on probability in detail. It is an often-quoted aphorism: “There are lies, damned lies, and statistics.” Presumably probability estimates can fit in there somewhere close to statistics. This brief review shows that probability is a difficult subject (did you need to be told that?). It is easily done badly, and easily misused, often due to faulty assumptions. No doubt I’m as likely to get it wrong as any other amateur. I think we must be careful who we believe on probability, and prefer those who have real knowledge and experience in its application. I will always be wary of someone who is not well qualified and who argues that all the experts are wrong. 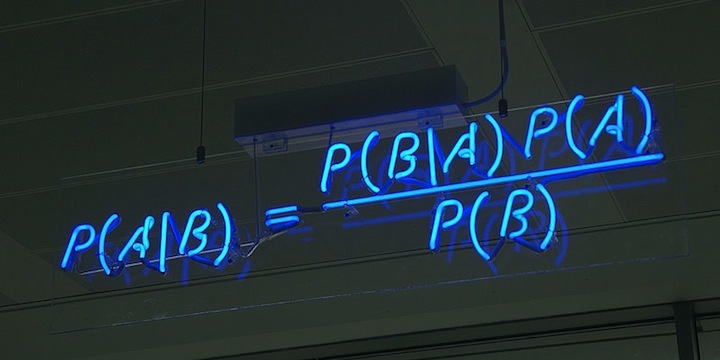 Picture: Bayes Theorem in lights, by mattbuck, in Wikipedia. You might wonder why anyone would make a neon sign of Bayes Theorem. It is, or was, at the offices of HP Autonomy, a computer software company, at Cambridge, UK. « Too many preconceptions about the Bible?